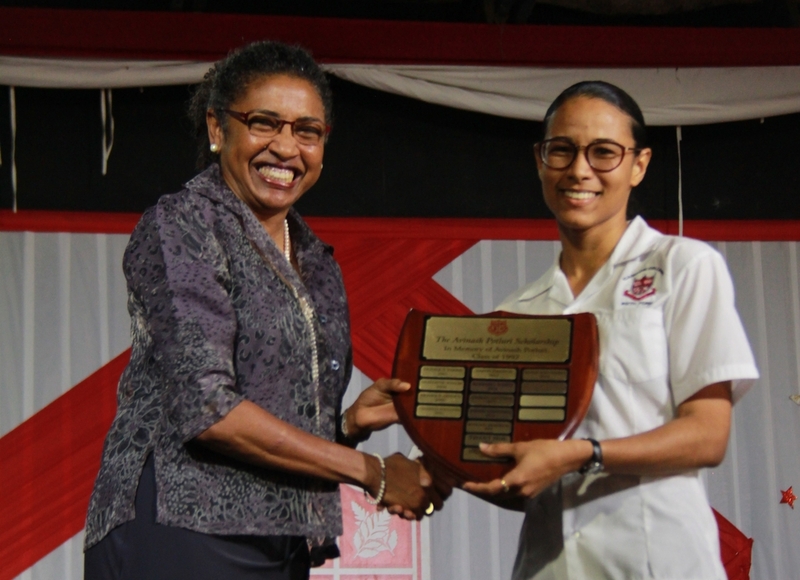 Campion College uses its Magis Awards Ceremony to recognise and celebrate students who performed exceptionally well in academics, sports and extra-curricular activities. 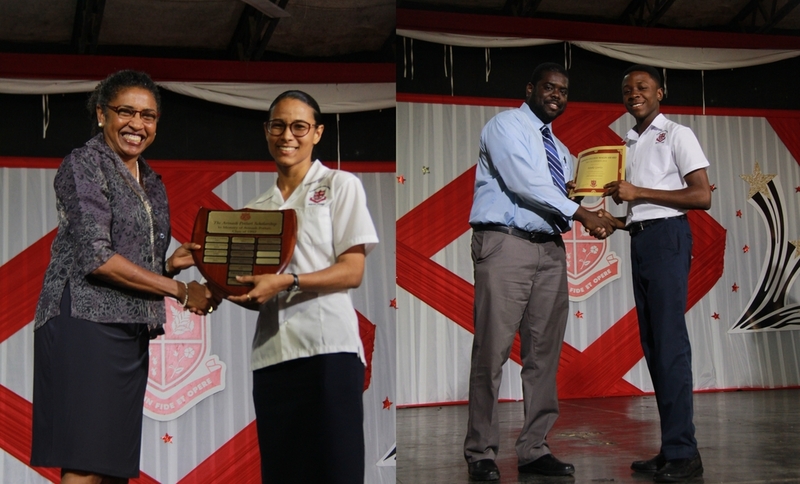 Kingston-based high school, Campion College recently hosted the CXC-edition of its annual Magis Awards ceremony to celebrate outstanding performances in the 2018 CAPE and CSEC examinations. “Campion College uses its Magis Awards Ceremony to recognise and celebrate those members of our Campion family who, in a given academic year, epitomised the magis through their excellence in service, school citizenship, sports and academics,” said Grace Baston, Principal, Campion College. Traditionally, Campion held one such ceremony to honour all its outstanding students, including fifth and sixth form students who excelled at the CAPE and CSEC examinations. These students would have achieved seven or more grade one passes for CSEC and four or more grade one passes for CAPE, in one sitting. In recent years, however, the number of students attaining this standard has grown significantly, making it impossible to include them all in the school’s regular Magis Awards ceremony and hence the birth of the Magis Awards - CXC Edition. 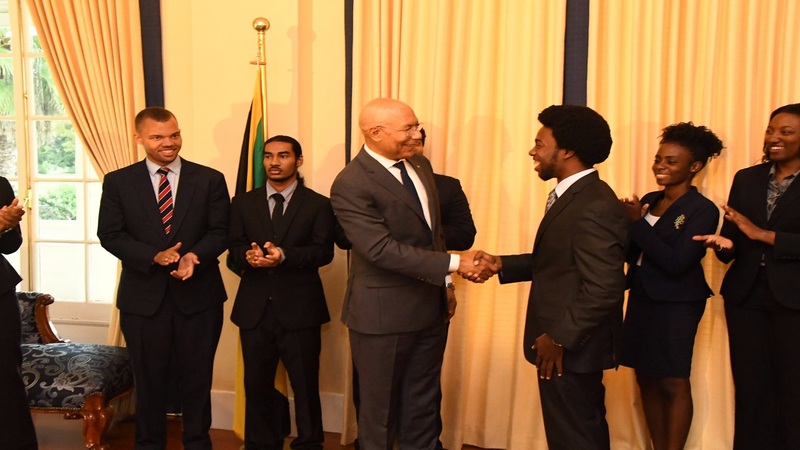 “This year we honoured 281 students for their outstanding performance on the 2018 sitting of the CAPE and CSEC examinations. Of that number 130 are from last year’s fifth form cohort, two from the fourth form and 149 are students who were in our upper and lower 6th form classes,” shared Baston. Each year, Campion awards the top CSEC student with the Avinash Potluri trophy and scholarship – named for a deceased alumnus and provided by his parents. This year, the trophy was awarded to Renee Ann Meeks, who in one sitting earned ten Grade one passes with straight A profiles in each subject. 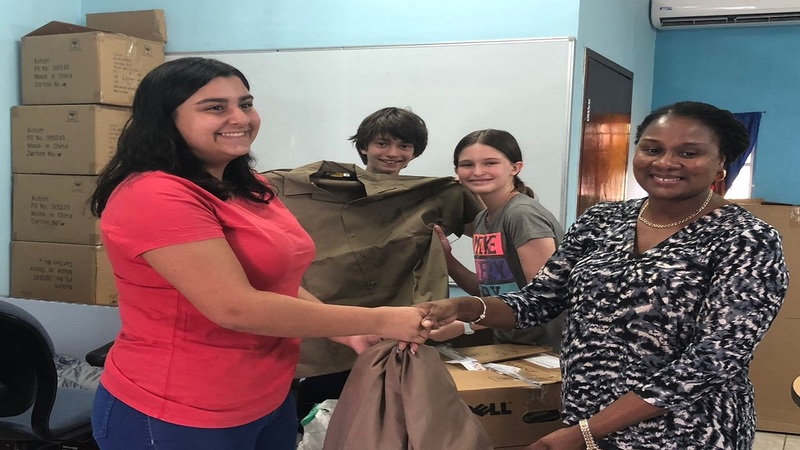 Grace Baston (left), Principal, Campion College presents the top CSEC student, Renee Ann Meeks with the Avinash Polturi trophy and scholarship. “I feel honoured to be a recipient of this trophy, an award that has been given to Campionites who I consider to be role models. It’s an amazing feeling to be acknowledged in front of the entire Campion community; this award motivates me to work even harder to make my family and school family proud,” said Meeks. Campionites also dominated the National and Regional Merit lists for both examinations. 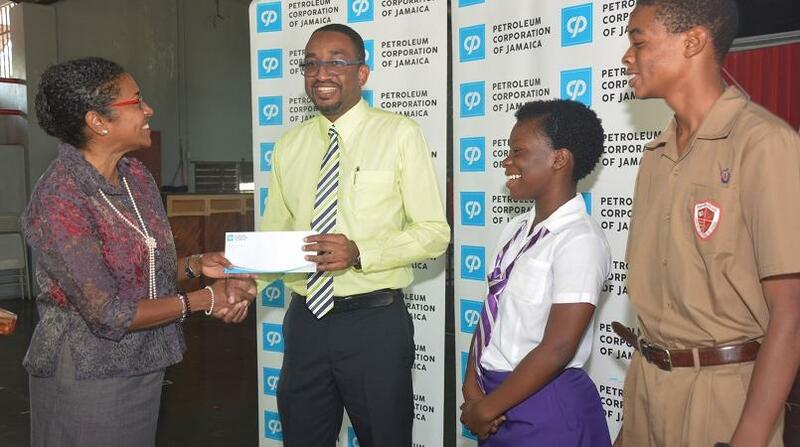 In the ranking of the top ten performers at the CSEC level, Campion College students claimed 83 places nationally and 32 places regionally. Of this set of scholars, special recognition should be given to Runako Gentles, who attained nine Grade 1 passes with straight A profiles and placed in seven subjects on the national merit list and in four subjects on the regional merit list. 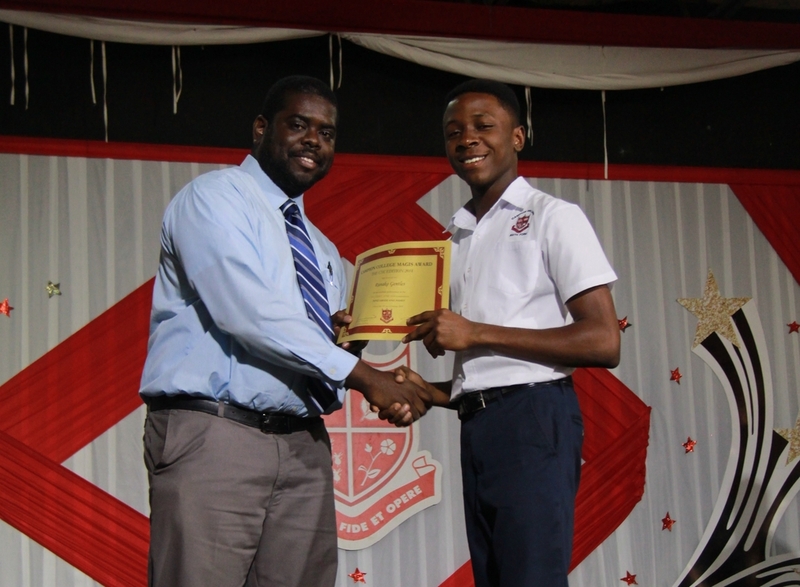 Lavare Henry (left), Vice Principal, Campion College presents Runako Gentles with a Magis Award for his outstanding performance in the 2018 CSEC examinations. Meanwhile, on the CAPE, Campion had 121 students appearing on the National Merit list and 47 on the Regional list. The most outstanding students were Alexia Campbell who placed 4 times nationally in Unit 1 and twice regionally as well as Dian Palmer who also placed 4 times nationally and earned one regional placement. Campion College had more students on both the CSEC and CAPE Regional Merit lists than any other secondary school in the Caribbean. “The Campion College community celebrates the achievements of our students as we understand the hard work and dedication that goes into these accomplishments, and for that we are proud!” shared Baston.